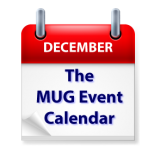 On this week’s MUG Event Calendar, Bob “Dr. Mac” LeVitus will visit a Texas group, online shopping technology will be the topic at a Colorado group, and holiday parties reign supreme at groups in Virginia, New Mexico, Kansas, Colorado, Florida, Michigan, North Carolina and more. For those not celebrating, there will be presentations on photos, iMovie, FileMaker, the iPad, Apple TV, and more.